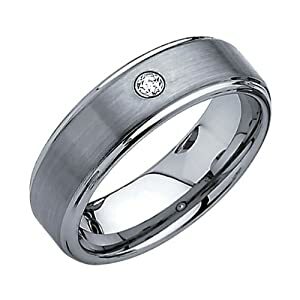 As the wedding day gets nearer and nearer I am really struggling for what ring to get Morgan. 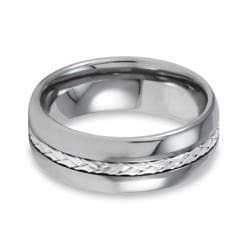 I know a lot of you out there will have the help of your significant other in choosing their wedding band, but Morgan has said he wants it to be a surprise and that whatever I get he will love...of course. He bought my ring in a set, so he already has the perfect band for me...so now I have to come up with something that will compliment my ring without going over the top, he doesn't like a whole lot of bling, or spending too much money. My ring is white gold set with diamonds and sapphires (my birth stone). I would really like to get him something that might compliment my ring...I do however know for sure that his ring needs to be tungsten. Tungsten is a harder than titanium, precious metal that supposedly does not scratch. 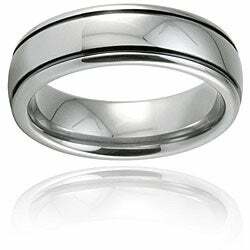 Because he does a lot of work with his hands, I definitely want his ring to be tungsten so it doesn't get ruined. I have scratches on my ring already just from every day wear and tear. You see my confusion...do I get him something unique, or something simple and classic? I am leaning more on the simple side...just because that is more him, but it is his wedding band and should be some-what special. Any suggestions out there?